Introduction: Thyroid nodules (TNs) are extremely common and most of them are benign in nature. Cryoablation is used in a variety of clinical applications, and has been applied in focal treatment as a substitute or an adjunct to surgery and other nonoperative modalities. Objectives: The objective is to evaluate the effect of cryoablation on the size and function of TN. Subjects and Methods: This was an interventional therapeutic study, conducted at endocrinology clinic, Ain Shams University Hospitals. Our study sample included 80 participants, aged between 20 and 60 years, having TN diagnosed by ultrasound (US). The participants were divided into two groups: Group 1 (control group) included 40 participants who were not subjected to cryoablation and Group 2 (cases) included 40 participants upon which cryoablation was done. Neck US was done for participants and they were sampled for their thyroid-stimulating hormone (TSH), free triiodothyronine (FT3) and free tetraiodothyronine (FT4) levels at start and after 3 and 6 months. Results: There was a high statistically significant difference between Group 1 and Group 2 regarding nodule size after 6 months (0.87 ± 0.25 cm vs. 0.67 ± 0.21 cm, respectively, P < 0.001), in spite of non-significant difference between both groups at the start of study (0.79 ± 0.29 cm vs. 0.83 ± 0.29 cm, respectively, P = 0.619). 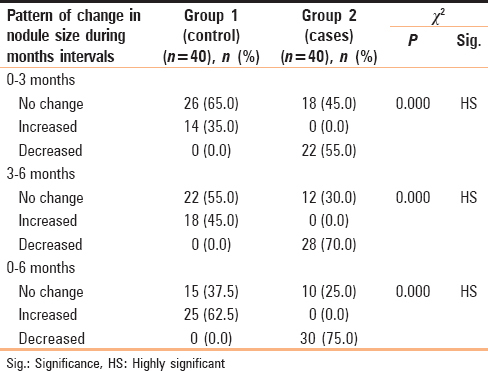 The median percentage of change in nodule size from 0 to month 6 in control group was +12.50% (IQR: 0%–22.5%), while in cases was −25.0% (IQR: −50%–−4.17%), P < 0.001. Regarding thyroid function tests, there was no statistically significant difference between both groups all through our study. Conclusions: Cryoablation causes nodule size reduction, while it does not affect thyroid function tests. The best treatment for benign nodules remains uncertain. Alternatively to thyroidectomy, various nonsurgical, minimally invasive techniques have been developed over the past decade, favoring not a removal, but only the local ablation of the TNs. Cryotherapy has been used as early as the 20th century. Its goal is to decrease cell growth and reproduction (cellular metabolism), decrease inflammation, decrease pain and spasm, promote the constriction of blood vessels (vasoconstriction), and use extreme temperatures to destroy diseased cells. The aim of the current study was to evaluate the effect of cryoablation on the size and function of TN. This was an interventional therapeutic study, conducted on 80 participants, at the outpatient clinic of endocrinology, Ain Shams University Hospitals. Their age ranged from 20 to 60 years. All the participants were subjected to full medical history taking, general clinical examination, and laboratory investigations including thyroid stimulating hormone (TSH), free triiodothyronine (FT3) and free tetraiodothyronine (FT4) levels as well as neck ultrasound (US). Thyroid function tests (TSH, FT3 and FT4) were performed in Chemical Pathology Unit, Ain Shams University Hospitals on ELISA Reader Stat Fax 2100 using Enzyme Immunoassay Kits supplied by DRG International Inc., USA. The normal ranges of serum hormone concentrations were as follows: FT3 = 1.2–4.4 pg/ml, FT4 = 0.8–2 ng/dl, and TSH = 0.5–5 mIU/L. Neck US was done in the department of radiology, Ain Shams University Hospitals by a single experienced radiologist. Patients with TNs were invited to participate in our study. We included 80 patients with a solitary or dominant TN without signs of malignancy (nonsuspicious clinical and US appearance and benign cytology performed in the past 6 months). Mixed TNs were only included when the solid component was >50% of the nodular volume. Exclusion criteria were the presence of malignancy or suspected malignancy detected by fine-needle aspiration biopsy. The participants were divided into two groups: Group 1 (control group) included 40 participants who were not subjected to cryoablation and Group 2 (cases) included 40 participants upon which cryoablation was done. Cases were subjected to cryotherapy sessions, in the form of one session weekly for 4 weeks, then one session at month 3, and another session at month 6. Cryotherapy sessions were done while patients were fully conscious. Cryotherapy apparatus was connected to both nitrous oxide (NO) cylinder and cryoprobe. Cryoprobe was applied externally to the skin over the area of the TN guided by US. Time of application was divided into three intervals, 3 min each, separated by 1-min pause. Temperature at the tip of cryoprobe was −73°C. Thyroid function tests and neck US were repeated to all the participants at month 3 and at month 6. Data were analyzed using SPSS (ver. 18; IBM Incorporation; 1111 International Business Machines Corp., [New Orchard Road Armonk, New York, USA]). Data were tabulated and graphically illustrated. Numerical data were tested for normality with D'Agostino–Pearson test; normally distributed data were presented as mean ± standard deviation and nonnormally distributed data were presented as median (interquartile range [IQR]). Categorical data were presented as number and percentage of total. Comparative analysis of numerical data was performed with unpaired Student's t-test or Mann–Whitney U-test depending on the normality of data. Comparative analysis of categorical data was done with Chi-square test. The significance of the test was determined according to the P value to be non-significant if P > 0.05, significant if P < 0.05, and highly significant if P < 0.01. The study aim and method were explained to all patients, and informed written consents were received from them. Ethical approval was obtained from Ain Shams University, Faculty of Medicine, Research Ethics Committee. There was no statistically significant difference between the study groups regarding age, gender, and thyroid function tests [Table 1]. Regarding nodule size, there was no statistically significant difference between control group and cases at the start of study (0.79 ± 0.29 cm vs. 0.83 ± 0.29 cm, respectively, P = 0.619), while there was a significant difference between both groups at month 3 (0.83 ± 0.23 cm vs. 0.71 ± 0.25 cm, respectively, P = 0.028), and a high statistically significant difference at month 6 (0.87 ± 0.25 cm vs. 0.67 ± 0.21 cm, respectively, P < 0.001) [Table 2]. 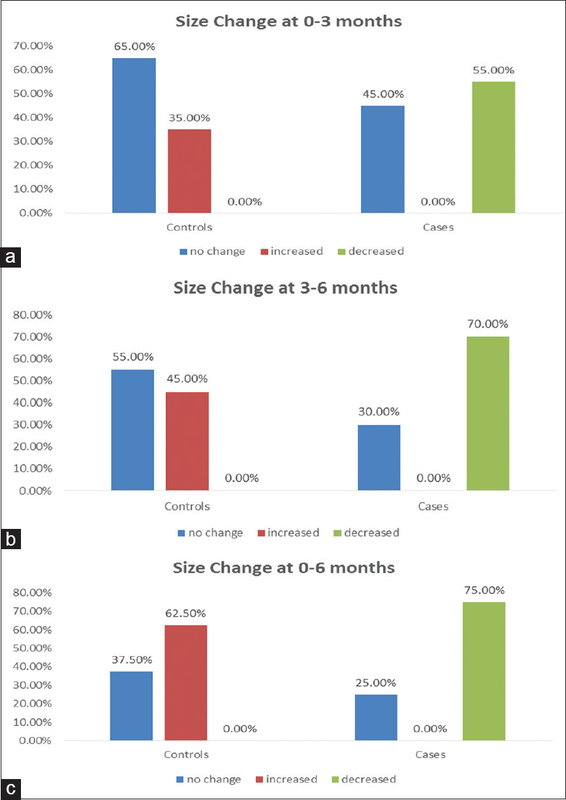 Regarding the percentage of change in nodule size in both groups, there was a high statistically significant difference between control group and cases when comparing the difference in nodule size during three time intervals; between the start of study and month 3 (0–3 months), between month 3 and month 6 (3–6 months), and between the start of study and month 6 (0–6 months). The median percentage of change in nodule size from 0 to month 3 in control group was 0% (IQR: 0%–14.29%), while in cases was −12.5% (IQR: −33.33%–0%), P < 0.001. From month 3 to 6, control group showed change of 0% (IQR: 0%–14.29%), while cases showed −14.84% (IQR: −25%–0%), P < 0.001. From 0 to month 6, the change in control group was +12.50% (IQR: 0%–22.5%), while in cases was −25.0% (IQR: −50%–−4.17%), P < 0.001 [Table 3]. Among control group, during the interval from 0 to 3 months, 26 participants (65%) showed no change in nodule size, 14 participants (35%) showed increase in nodule size, and none showed decreased nodule size, while among cases, 18 participants (45%) showed no change in nodule size, 22 participants (55%) showed decrease in nodule size, and none showed increase in nodule size. During the interval from 3 to 6 months, 22 participants of control group (55%) showed no change in nodule size, 18 participants (45%) showed increase in nodule size, and none showed decrease in nodule size, while 12 participants of cases (30%) showed no change in nodule size, 28 participants (70%) showed decrease in nodule size, and none showed increase in nodule size. From 0 to 6 months, 15 participants of control group (37.5%) showed no change in nodule size, 25 participants (62.5%) showed increase in nodule size, and none showed decrease in nodule size, while among cases, 10 participants (25%) showed no change in nodule size, 30 participants (75%) showed decrease in nodule size, and none showed increase in nodule size [Table 4] and [Figure 1]. 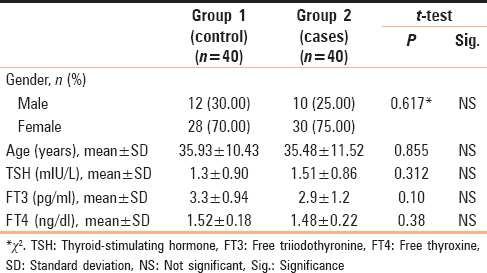 There was no statistically significant difference between control group and cases regarding thyroid function tests in the end of study (at month 6) [Table 5]. Regarding the percentage of change in thyroid function tests in both groups, there was no statistically significant difference between control group and cases when comparing the difference in thyroid profile during three time intervals; between the start of study and month 3 (0–3 months), between month 3 and month 6 (3–6 months), and between the start of study and month 6 (0–6 months) [Table 6]. In our study, we aimed to evaluate the effect of cryoablation on the size and function of TN (a solitary or dominant TN). To our knowledge, this represents the first completed cryotherapy study on human thyroid gland. Regarding nodule size, we found no statistical significant difference between control group and cases at the start of study (0.79 ± 0.29 cm vs. 0.83 ± 0.29 cm, respectively, P = 0.619), while there was a high statistically significant difference between control group and cases regarding nodule size in the end of study (month 6) (0.87 ± 0.25 cm vs. 0.67 ± 0.21 cm, respectively, P < 0.001). However, there was no statistically significant difference between control group and cases regarding thyroid function tests neither at the start nor in the end of study, and no statistically significant difference between both groups regarding the percentage of change in thyroid function tests all through our study. Previously, in an experimental rat model, Pomorski et al., 1999, showed that it is possible to cryoablate normal thyroid tissue without damaging the tissues adjacent to it and to spare function of the recurrent laryngeal nerves and parathyroid glands. They also described macro- and microscopic changes in cryotreated normal rat thyroid tissue. In 2000, Pomorski et al. continued their studies to investigate postcryotherapy thyroid function status of normal rat thyroid tissue and to determine the topography of temperature of cryotreated tissues and of tissues adjacent to them. The rats were divided into four groups. In rats of Group I, the right thyroid lobe was subjected to cryotherapy and the left thyroid lobe was not frozen. In rats of Group II, both thyroid lobes were cryotreated. In rats of Group III, the right thyroid lobe was frozen and the left lobe was excised. In rats of Group IV (control group), the thyroid was subjected to neither cryotherapy nor surgery. Their results showed that thyroid cryotherapy changes the function of thyroid tissue. Hypothyroidism occurred postcryotherapy in rats that were subjected to cryotherapy of both thyroid lobes or cryotherapy of one lobe and excision of the other lobe, which means that cryotherapy in an experimental model is as effective as the excision of a thyroid lobe. TSH values before and following cryotherapy in rats of Group I did not differ statistically. There was no significant difference between the TSH mean follow-up concentration in rats of Group I and that of Group IV, which is evidence that the function of the thyroid lobe not subjected to cryotherapy is unaltered and that this thyroid lobe can maintain normal thyroid function. These results showed that it is possible to cryoablate focal thyroid lesions without disturbing function of the remaining gland. Clinically, cryosurgery is invaluable for the treatment of advanced thyroid cancer not only for reducing tumor bulk, but also for arresting hemorrhage, and alleviating intractable pain, while not seriously damaging the juxta tumor vital organs of the neck, for example, preserving major blood vessels. A beneficial effect of a tumor-specific cryoimmunologic reaction elicited by cryosurgery would be expected, which will lead to the reduction in size of the tumor bulk and improve quality of life of the patient, since the thyroid gland is known as one of the highly immunogenic organs in man. Cryotherapy was also reported as a technique for the treatment of bone metastases from thyroid cancer. Local cell death occurs within 5 mm of the ice formed by the metallic probe if the temperature achieved is <40°C on two sequential cryotherapy cycles. One study evaluated 14 patients with metastatic osteolytic disease from various primary tumor types. None of the patients treated with cryotherapy suffered neurological injury, and there were no pathological fractures. Although the data for cryotherapy of skeletal lesions from thyroid cancer are scant, this technique seems to be a valuable addition to the therapeutic armamentarium for the management of bone metastases from thyroid cancer with the potential of minimal risk to local surrounding structures. In our study, no adverse effects reported to any of the participated patients. Hence, we consider that cryoablation of TNs is a safe procedure without serious complications. Moreover, the main advantage to surgery is the performance in outpatient base, with only local anesthesia or conscious sedation, or no anesthesia at all, as well as the short recovery time. Finally, we recommend long-term follow-up outcome from larger controlled and randomized studies with well-established selection criteria in order to define the spectrum of thyroid pathologies mostly suitable for this treatment. Comparable studies with other thermal techniques such as laser, radiofrequency, and microwave ablation should also be considered. In the future, new indications should be investigated, such as autonomously functioning nodules, recurrent Graves' disease, nodules with undetermined or suspicious cytology, and even thyroid microcarcinoma. Cryoablation causes nodule size reduction, however, it does not affect thyroid function tests. Cryoablation is effective and safe noninvasive treatment method for benign solid TNs. We wish to express our gratitude to the department of radiology, the department of ophthalmology and medical laboratory department, Ain Shams University, for being abundantly helpful and offering invaluable assistance, support and guidance. Deepest gratitude is to the department of public health, Ain Shams University, for the invaluable consultations in biostatistical analysis. Haugen BR, Alexander EK, Bible KC, Doherty GM, Mandel SJ, Nikiforov YE, et al. 2015 American thyroid association management guidelines for adult patients with thyroid nodules and differentiated thyroid cancer: The American Thyroid Association guidelines task force on thyroid nodules and differentiated thyroid cancer. Thyroid 2016;26:1-33. Popoveniuc G, Jonklaas J. Thyroid nodules. Med Clin North Am 2012;96:329-49. Perez CL, Fighera TM, Miasaki F, Mesa Junior CO, Paz Filho GJ, Graf H, et al. Evaluation of percutaneous ethanol injections in benign thyroid nodules. Arq Bras Endocrinol Metabol 2014;58:912-7. Tunbridge WM, Evered DC, Hall R, Appleton D, Brewis M, Clark F, et al. The spectrum of thyroid disease in a community: The Whickham survey. Clin Endocrinol (Oxf) 1977;7:481-93. Tan GH, Gharib H. Thyroid incidentalomas: Management approaches to nonpalpable nodules discovered incidentally on thyroid imaging. Ann Intern Med 1997;126:226-31. Guth S, Theune U, Aberle J, Galach A, Bamberger CM. Very high prevalence of thyroid nodules detected by high frequency (13 MHz) ultrasound examination. Eur J Clin Invest 2009;39:699-706. Hegedüs L. Clinical practice. The thyroid nodule. N Engl J Med 2004;351:1764-71. Lin JD, Chao TC, Huang BY, Chen ST, Chang HY, Hsueh C, et al. Thyroid cancer in the thyroid nodules evaluated by ultrasonography and fine-needle aspiration cytology. Thyroid 2005;15:708-17. Erdogan MF, Gursoy A, Erdogan G. Natural course of benign thyroid nodules in a moderately iodine-deficient area. Clin Endocrinol (Oxf) 2006;65:767-71. Longo M, Cassoli IP, Fugazzola L, Vannucchi G, Lanzoni M, Castaldi S, et al. Feasibility study for the introduction of a new treatment method for benign thyroid nodules in a teaching and research hospital. J Eval Clin Pract 2014;20:617-21. Pournot H, Bieuzen F, Louis J, Mounier R, Fillard JR, Barbiche E, et al. Time-course of changes in inflammatory response after whole-body cryotherapy multi exposures following severe exercise. PLoS One 2011;6:e22748. Carroll PR, Presti JC Jr., Small E, Roach M 3rd. Focal therapy for prostate cancer 1996: Maximizing outcome. Urology 1997;49:84-94. Liu CL, Fan ST. Nonresectional therapies for hepatocellular carcinoma. Am J Surg 1997;173:358-65. Millikan KW, Taren ED, Doolas A. Invasive therapy of metastatic colorectal cancer to the liver. Surg Clin N Am 1997;77:27-47. Shinohara K, Rhee B, Presti JC Jr., Carroll PR. Cryosurgical ablation of prostate cancer: Patterns of cancer recurrence. J Urol 1997;158:2206-9. Gage AA. History of cryosurgery. Semin Surg Oncol 1998;14:99-109. Sung JY, Baek JH, Kim KS, Lee D, Yoo H, Kim JK, et al. Single-session treatment of benign cystic thyroid nodules with ethanol versus radiofrequency ablation: A prospective randomized study. Radiology 2013;269:293-300. Halenka M, Karasek D, Frysak Z. Ultrasound-guided percutaneous ethanol injection of small and medium-sized thyroid cysts with relatively small amounts of ethanol. Biomed Pap Med Fac Univ Palacky Olomouc Czech Repub 2015;159:417-21. Bennedbaek FN, Hegedüs L. Treatment of recurrent thyroid cysts with ethanol: A randomized double-blind controlled trial. J Clin Endocrinol Metab 2003;88:5773-7. Valcavi R, Frasoldati A. Ultrasound-guided percutaneous ethanol injection therapy in thyroid cystic nodules. Endocr Pract 2004;10:269-75. Baek JH, Lee JH, Valcavi R, Pacella CM, Rhim H, Na DG, et al. Thermal ablation for benign thyroid nodules: Radiofrequency and laser. Korean J Radiol 2011;12:525-40. Feng B, Liang P, Cheng Z, Yu X, Yu J, Han Z, et al. Ultrasound-guided percutaneous microwave ablation of benign thyroid nodules: Experimental and clinical studies. Eur J Endocrinol 2012;166:1031-7. Achille G, Zizzi S, Di Stasio E, Grammatica A, Grammatica L. Ultrasound-guided percutaneous laser ablation in treating symptomatic solid benign thyroid nodules: Our experience in 45 patients. Head Neck 2016;38:677-82. Baek JH, Lee JH, Sung JY, Bae JI, Kim KT, Sim J, et al. Complications encountered in the treatment of benign thyroid nodules with US-guided radiofrequency ablation: A multicenter study. Radiology 2012;262:335-42. Di Rienzo G, Surrente C, Lopez C, Quercia R. Tracheal laceration after laser ablation of nodular goitre. Interact Cardiovasc Thorac Surg 2012;14:115-6. Blackwood CE, Cooper IS. Response of experimental tumor systems to cryosurgery. Cryobiology 1972;9:508-15. Hamad GG, Neifeld JP. Biochemical, hematologic, and immunologic alterations following hepatic cryotherapy. Semin Surg Oncol 1998;14:122-8. Pomorski L, Bartos M, Matejkowska M, Amsolik M, Kuzdak K. Thyroid cryotherapy in an experimental rat model. Cryobiology 1999;39:262-70. Pomorski L, Bartos M, Amsolik M, Cieplucha J, Jóźwik K, Narebski J, et al. Thyroid cryotherapy in an experimental rat model-topography of temperature during therapy and functional results. Cryobiology 2000;41:51-7. Tanaka S. Cryosurgery of unresectable, advanced or recurrent thyroid cancer. In: Vi N, Torizuka K, Miyai K, editors. Current Problems in Thyroid Research. International Congress Series No. 605. Amsterdam: Excerpta Medica; 1982. p. 601-4. Tanaka S. Immunological aspects of cryosurgery in general surgery. Cryobiology 1982;19:247-62. Robinson D, Yassin M, Nevo Z. Cryotherapy of musculoskeletal tumors – From basic science to clinical results. Technol Cancer Res Treat 2004;3:371-5.